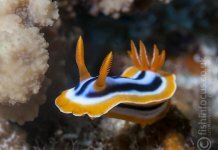 Starting Out in Underwater Photography – for the absolute beginner or just the curious. 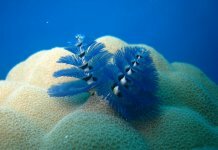 This is an overview of underwater photography taking the approach that you are a complete beginner, both in diving and photography and even if you already have a topside understanding of photo skills it’s worth a read as a new diver. Alternatively you may well be an experienced diver wanting to get into underwater photography, and need to get a handle on the basics. 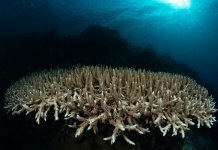 So if you are planning your first foray into the world of underwater photography, proper planning and preparation are a must. Your safety and that of your “buddy” must top your list of priorities. If you are a novice with fewer than 50 dives it is a good idea to enlist the services of a dive buddy who is significantly more experienced than you, so you can practise your skills without stepping outside your comfort zone. 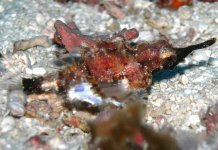 For this reason it is usually best to use a digi-compact camera in a suitable underwater housing before venturing into the more task-intensive world of the housed DSLR or fully manual compact or Mirrorless camera. Compact or Mirrorless Cameras have made underwater photography more accessible to more people, than ever before. 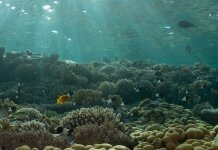 Your choice of underwater camera is dictated by a number of important criteria, the most obvious being whether there is housing available for it. Vital questions I ask about any prospective new camera is can it do custom white balance? and can I attach a wide-angle lens to the housing? 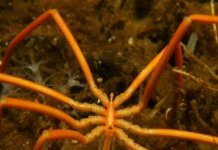 Of lesser importance until you are comfortable photographing underwater are more high-end features such as RAW and full manual controls. Trying too much too soon can be dangerous and lead to task loading that can be hazardous. A lot of the shots I’ve used to illustrate this piece are shot in good available light in clear water using only compact cameras. It’s relatively inexpensive these days to venture abroad to somewhere like the Egyptian Red Sea to put into practice your skills.And for those just starting out I would recommend the Canon Powershot range of compact cameras, as being perfectly suited to the simple techniques required. The deeper you go underwater the more you lose the colour red and photos will quickly take on a flat blue tone. This can be fixed using a technique that the Canon Powershots can achieve using just one-touch and the technique is called custom white balance. A lot of cameras have an underwater setting,which can be okay in shallow water, but is next to useless for scuba diving which happens at a variety of depths. I mentioned using Wide Angle Lenses and I’ve written a blog post earlier that covers this in greater detail “here” but in short, water is considerably denser than air,which means colour, clarity and contrast fall off very quickly the further you are from the subject, even in the clearest conditions. So attaching a wide-angle or even a fish-eye lens to the outside of your camera housing will allow you to get much closer to the subject, but at the same time keep all of your intended subject in full view. Reducing the water column like this has transformed what is possible with basic point-and-shoot cameras underwater. And I cannot stress what a big difference this makes to be able to use an additional wide angle lens like this. This shot below blown up for a huge banner, was taken just like this using a wide angle lens and the aforementioned custom white balance. A dolphin shot taken on an 8yr old compact camera using Custom White Balance and a wide-angle lens attached to the compact. Before any dive it is important to carry out practical checks of your photographic equipment. This is as important as carrying out all your dive equipment checks alongside your buddy. This means making sure you have enough space on your memory card, your battery is fully charged and that you have carried out any cleaning and lubrication of your housing’s rubber seals, known as O-Rings. This should all be done well in advance of your dive briefing. If you are using a dive guide, pay particular attention to features they mention that you think will offer good opportunities to take pictures, such as caves, swim-throughs or large photogenic coral formations. Maybe plan with your buddy about possible photo opportunities, and how they can take part and be part of the picture. It’s vitally important to make sure that you check things very carefully before you go diving. 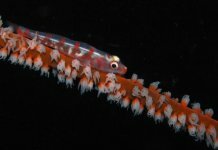 There may well be marine life unique to that area that you will want to photograph. Jot these things down on to a dive slate if you have difficulty remembering things. It’s a big temptation to take every bit of underwater photography kit you own on your dive, which is why it is important to listen to your dive brief and take only the equipment you think is necessary. I always try to reduce my equipment choices. If anything it forces you to think more creatively. For most dives with a compact set up I carry only my camera and housing, and a wide-angle lens. If you are a competent diver and your guide is happy for you and your buddy to hang back from the group, allow a few minutes to take stock of everything around you. Look at where the sun is in relationship to the reef and the overall topography of the area. Unless I am deliberately shooting a silhouette, I prefer to keep the sun behind me. This is the best orientation if you want to shoot available light and use custom white balance. I also like to shoot during the ‘golden hour’ just before and just after sunset and sunrise. I find the colours, shapes and shadows take on their most dramatic aspect. A shot taken in the hour just after sunrise, a great time to capture dramatic and colourful available light shots. It is also the best time to observe many marine animals in action, as this time usually coincides with feeding habits. Most places with the best diving are also marine reserves with strict rules that do not allow divers to touch the reef. This means tripods are out of the question and so your dive skills are the key factor in getting you close to the action. First-class buoyancy control,or the ability to keep level in the water, will ensure you are a stable platform from which to take pictures. It’s very important that you are as stable as possible when shooting underwater pictures. It’s maybe a good idea if your new to diving to reduce your frustration in yourself and your underwater positioning by taking a specialist buoyancy course early in your diving career, this will pay dividends, and most instructors will be only too glad to help you do this and all you need to do is just ask. Lets get back to the nitty gritty of using the camera I normally set my camera in its spot-metering mode and use the half-pressure of the shutter release to lock the exposure. I then reframe for my final composition. This can be done in a jiffy when practised well and gives you unprecedented control of what is essentially a point-and-shoot camera. Even challenging exposure situations inside caves and wrecks can be mastered using this technique. As I’ve said a lot of the shots in this blog are taken using only these techniques. Half pressure of the shutter release has been employed here whilst pointing the camera towards the beams of light at the top. This is a great way of controlling a fully automatic camera and making it do what you want. So far we have covered what is possible using just in-camera controls and available light, and in fairly good conditions, but what if the prevailing conditions don’t allow us to shoot in this way? We can try to raise the ISO, but this compromises the picture quality and although compact cameras are getting better in this respect, I try never to go above 800 ISO when shooting. Therefore, once we have run out of available light we must think of alternative ways to light subjects underwater. External flash is the most common way to do this. These are triggered using fibre-optic cables and a slave triggering system, actuated by the camera’s own internal flash. They give a slightly increased range, up to a metre or so, but the main reason to use them is to be able to move the flash away from the axis of the camera lens. This helps reduce a problem known as ‘backscatter’.I have written a couple of blogposts here and here that covers shooting with flash and talks about this in much greater detail. People will also often use a high-powered video light to shoot both stills and video. This is not as practical for stills shooting as they aren’t as powerful as a flash, but as these cameras are also pretty good for underwater video, continuous lighting represents multifunctional practicality and usefulness.So they represent good value for money, just be aware they have a few limitations. Here we have a pair of photographers shooting using extra lights attached to their compact cameras. Note that the lighting is on an arm putting the flash/video light at a position to help reduce backscatter in their photographs. It is important to know the technical ins and outs of your camera so that it becomes second nature to you, but it is also important to be creative. With the average dive lasting only an hour or even less, it is important to be as prepared as you can for what you might encounter. For example, you may be at a dive site that you are only going to get one crack at before moving on, so find out what time of day you will be diving there. Find out where the sun is coming from. Are you there for a particular creature or feature? 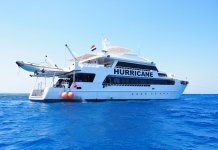 Most resort or live-aboard diving is carried out ‘multi-level’ which means you generally descend to your maximum depth usually no more than 30m and then work your way shallower over the course of the dive. As the light is much better above 15m I will usually head to the shallow water much sooner unless there is something noteworthy to shoot in the depths.This is one of the main reasons I advocate mastering available light shooting using custom white balance, as people get good colourful results from the off. This gives them a welcome confidence boost in their skills, before moving onto the slightly trickier topic of flash or additional lighting shooting. Get close to your subject and go very slow. New divers have a tendency to charge around, this uses up your air supply more quickly and frightens the fish. My advice is to take it easy, you will be more relaxed, which will make it easier to capture any skittish marine life you may encounter. It’s remarkable how close you can get to things if you take your time. If you’re careful, and go carefully and slowly you can get very close to your subject matter. Shooting upwards towards the surface is a time tested technique within underwater photography, however shooting down the reef from the shallows, with the top of the colourful reef in the foreground, the depths becoming inky blue is also equally valid. With shooting upwards allowing you to isolate your subject from the background and create either a silhouette or alternatively the plain blue background of the sky. There are also lots of opportunities for abstract shots underwater, so take them. Keep it simple – in a graphical sense, less is more. 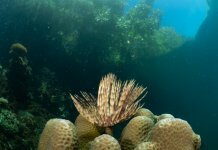 This Lionfish was taken using a very old compact camera, but by just working to it’s strengths, using available light, and positioning it against the sunlight, an effective and artistic silhouette can be made. If you have a compliant subject and it’s not bothered by your presence, take lots of shots and angles, you probably won’t be there the following week and your memory cards are the least expensive part of the equation. Ok what kit do you need? A typical current starter kit that I would advocate and that is easily capable of everything I’ve done to illustrate this article would be. Here is a link to Flippers N Fins website with one of our current favourites the Canon S120. This particular model will also readily accept wide angle lenses and strobes. Have a dry run with everything before you leave, so you avoid leaving behind anything vital. Think about spare housing O-Rings and any other spare O-Rings you may need, spare batteries are always a good idea, plus a cleaning kit for your camera, housing and any extra lenses you may have. Rinse the (sealed) housing in fresh water daily, to prevent the build-up of salt. You can clean and lubricate the O-Ring once it has dried off. Always have your camera in its housing ready to shoot. Back up your pictures regularly. Use fresh memory cards each day and put the originals away. Above all else you need to keep you and your buddy safe, and have fun. I find if I am enjoying the dive and the company it shows in my photos. Finally consider booking onto one of our dedicated photography themed Liveaboards, they are a fun and friendly way to learn, from the very basic stuff to more advanced, we get lots of repeaters on these trips,but you needn’t ever think that you will be left behind as a beginner. And we often stay longer at the same sites allowing you the time to repeat things at different times of day. Check out this photo trips blog post to give you an idea why these things are so much fun. 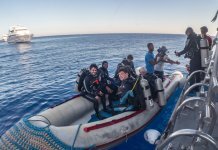 *STOP PRESS* Im running a perfect new itinerary for all skill levels in photography called Red Sea Relaxed in May and June, check them out and click here. Previous articleLighting and Editing for character.